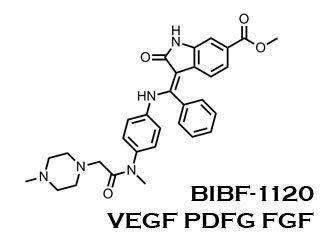 With BIRB-796 a distant memory, BIBW-2992 in ph3 and given the new name Tovok, BIBF-1120 headed into ph3 and given the name Vargatef, BI-2536 in multiple Ph2s, a new Ph1 Aurora inhibitor, and another backup PLK1 inhibitor undisclosed, but likely in-clinic or clinic-bound – what could possibly be next? 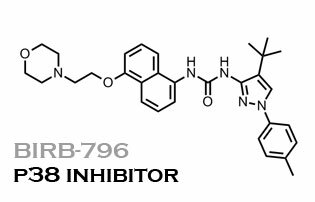 BI’s irreversible ErbB inhibitor to join the Ph3 club. WO/2007/90844 is a salt form application of a compound that we’ve seen before ’round here. Boehringer-Ingelheim’s got a series of 5-lipophile-substituted-pyrimidines claimed as ‘Aurora B’ inhibitors. 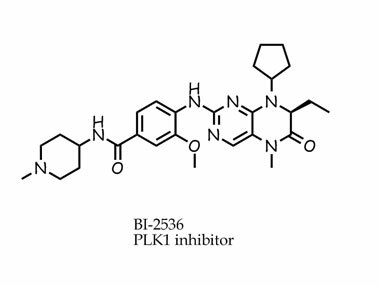 Hi BI, nice IKK inhibitors. These seem to hav evolved from alcohol hits first published in that ’03 application, which led to these aminoalcohols (WO2005056562). 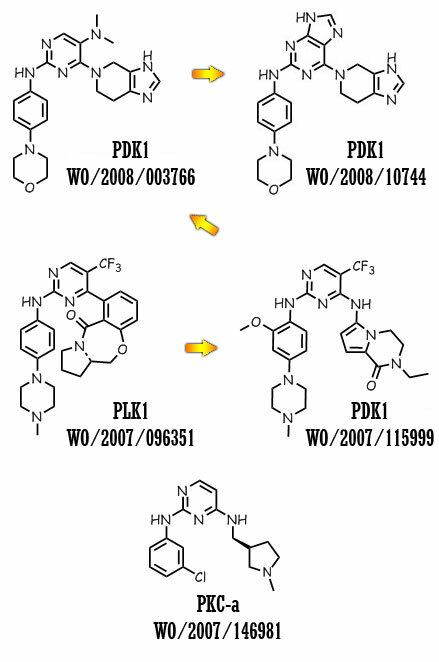 Hi Boehringer Ingelhiem, KP likes the BI piperidines/ pyran / cyclohexyl wrinkle on the quinazoline EGF compound series. More derivatives in this continuation, otherwise nothing much to see here. Not the standard solvent exposed yada-yada, though quite a bit different from the Amgen imidazalones. Second and a half generation: WO2006021378 (published 8/19/06) Looks as though you just realized the anilines were active, and rushed to cover them in this app. Hoho, otherwise this is the same as the previous, just reverse the [L]&C=O in the previous Markush. Third Generation: WO2006021547, and WO2006021548 (Published 3/2/06) Kinasepro’s trick elbow tells him BI is closing in on something though he thinks you should have a talk with the guy who put your patents together. Is the the jumbled up A, R2, and R3 on page 43 enough to invalidate? Neh, but KP hopes your attorney lays off the 3-Heineken lunches. Nice set of amines anyhow. smiles: yah, KP is trying a new thing with smiles. to see if they’er searchable.